… but sometimes those of us who are lucky enough to live here are so busy, we forget just how beautiful our surroundings are! Or maybe we just start to take it for granted? Either way, in the last couple of weeks, I’ve been reminded, both by personal visits and by news stories about the state budget crisis, of the incredible natural beauty, and unique history of the area, and the need to preserve them both! Alcatraz is the island in San Francisco Bay that everyone has heard of, along with Al Capone, it’s most famous former resident. But not far beyond Alcatraz lies the much larger Angel Island. A slice of wilderness in the middle of the bay, Angel Island was originally a hunting and fishing site for Coastal Miwok Indians, and later the West Coast equivalent of Ellis Island, when hundreds of thousands of mostly Chinese immigrants were held here prior to being allowed to enter the USA. 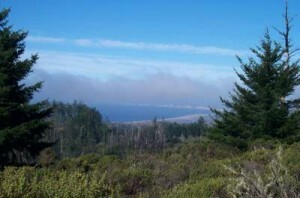 With great hiking trails, a fascinating history, and spectacular views of San Francisco, Mount Tamalpais and the East Bay, it’s a great place for a picnic, a hike, and, for those who want to learn more about the island’s history, a visit to the newly opened Immigration Station. However, once the crowds have left on the last ferry of the day, that’s when you can really experience the magic of this little piece of wilderness! 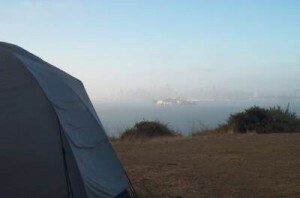 The campsites tend to book up months in advance, so some forward planning is required, but in my mind the best sites are the West Ridge sites, with views of the Golden Gate bridge, Alcatraz, and the San Francisco skyline. It’s hard to beat roasting ‘smores to the backdrop of city lights, fog rolling through the Golden Gate, and the surreal soundtrack of the foghorn! 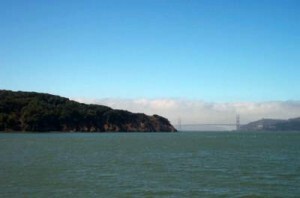 But Angel island is a California State Park, and as such still remains under threat of closure due to the state budget crisis. Park fees are being raised effective Monday, but even that will not be enough to prevent many park closures. I had heard that in the event the state does try to close some parks, the feds are ready to intervene. And on a recent visit to another local park, Point Reyes National Seashore, I had the opportunity to ask a National Park ranger about that. He told me he didn’t know all the details, but confirmed that Point Reyes does have some contingency plans to help out the local state parks should the ‘governator’ proceed with closures. 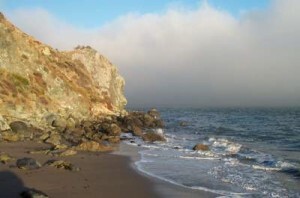 And after my recent visits to Angel Island and Point Reyes reminded me once again of the natural beauty of the San Francisco bay area, and the need to do everything we can to help keep our State Parks open, I also found a very evocative photo, that for me sums up our multicultural, mysterious, city by the bay. Click on the thumbnail below and see if you agree! Photo credit for ‘Dragon attacks Golden Gate bridge’: Caitlin of www.roamingtales.com, reproduced with permission.